Taekwondo is one of the numerous forms of martial arts that are practiced and performed around the world today. As a matter of fact, there are several institutes that have courses and training programs specially dedicated to this form of martial arts. Also, there are several taekwondo competitions and championships organised from time to time. In both cases, Certificates area awarded to the participants. Now to create the certificates, one may take the help of the following certificate templates. This certificate template keeps it simple and to the point. You have a black border and a monochromatic theme throughout. Plus, the certificate template comes in Word format as well. This certificate template comes with an attractive design, a catchy and well defined headline, a standard size, Word compatibility, easy customisation, editable elements, adjustable colour and a print ready format. This certificate template has to be one of the supreme examples of certificates given its impeccable design and easy to use format. Once you download it, you can easily edit and customise it. The thick red border on one side of the template gives it a distinctive look. The template certainly has a unique look and would be perfect as a certificate of excellence. 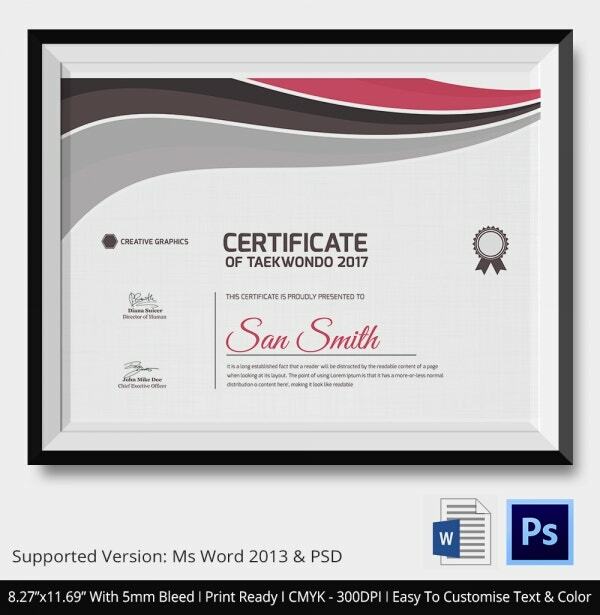 This certificate template comes in both Word and PSD formats. Also, it is fully editable and customisable. Once you download it, you will be able to change most elements. > Who can use the Taekwondo Certificates? 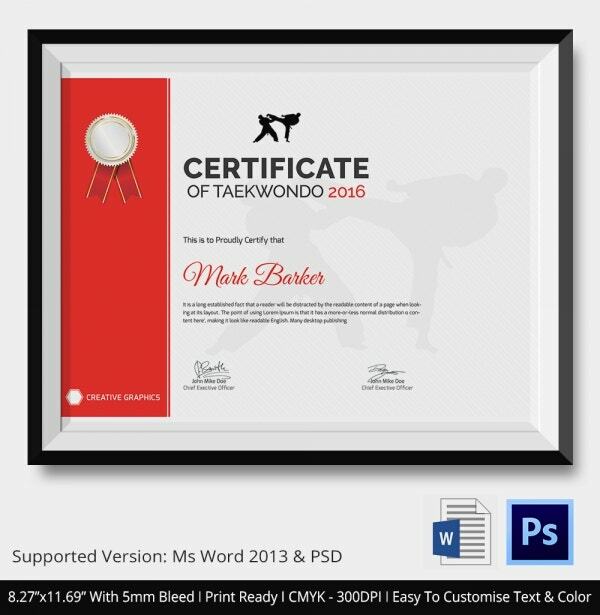 Now all the certificate templates that you see here are highly specialised. That means, they cannot be used for other events. Any event related to taekwondo may make use of such certificates. For example, an institute that offers special classes in taekwondo, would find these templates handy. Once the course or training program is completed, each student is to be awarded a certificate of completion. 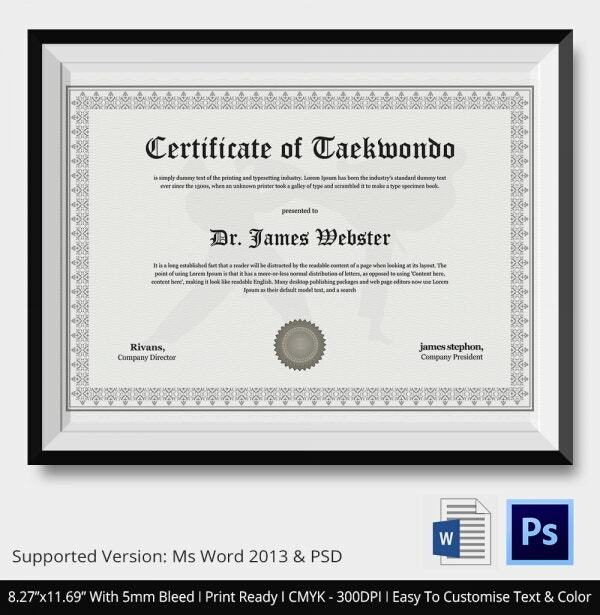 Similarly, the organisers of a taekwondo certificate would be able to use these certificate templates to design the certificate templates for the winners and participants. Thus, these templates are pretty multipurpose, versatile and flexible to say the least. > What do the Taekwondo Certificates Contain? 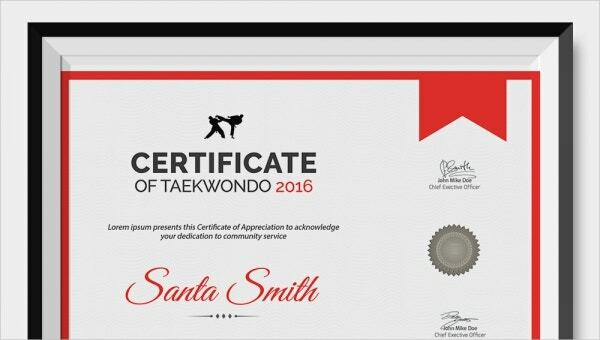 The taekwondo certificates are pretty much like the other certificates in terms of content. First of all, you must state whether the certificate you see is a certificate of completion, of achievement, of participation or of excellence. Next, you have the name of the person in clear bold terms so that it is highlighted. You usually have a border in your certificate; the border is bold and prominent so that it makes the certificate appear neat. The certificates also come with an attractive design which makes them look charming and appealing. They usually come with a subdued background. You can also see Sports Certificate Templates. If you are in charge of organising some kind of championship for taekwondo or maybe you own a school which teaches it, then you can use the above templates. 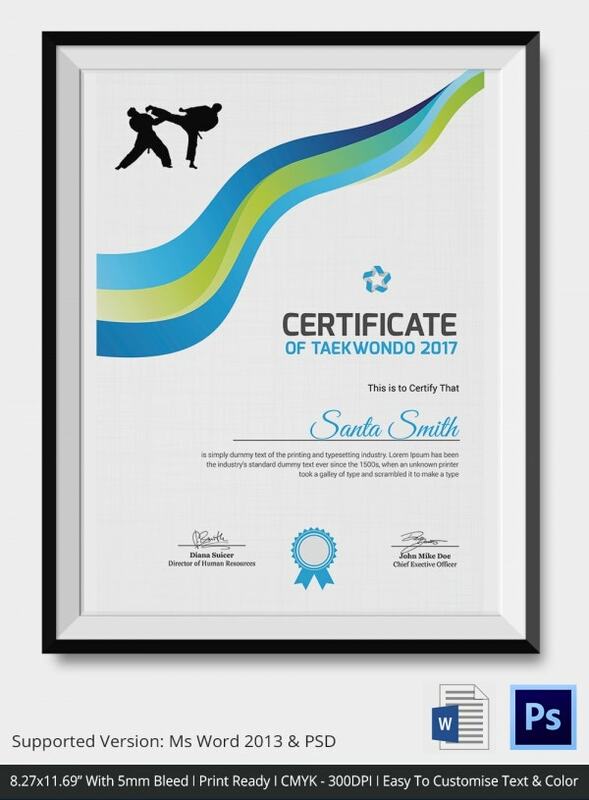 Each taekwondo certificate template that you see here is attractive, well designed, specialised and meaningful. All you have to do is download it!